When I first wrote about lamb mechoui five years ago, there were only a handful of posts about it on the internet. 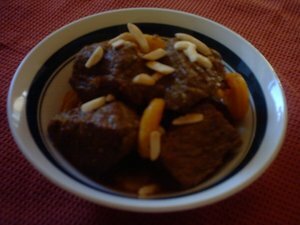 A recent Google search for lamb+mechoui shows about 30,700 results, including lamb mechoui for Easter and leftover Easter lamb rehashed as a tagine the next day. I like authenticity, but I know cuisines adapt all the time. Cuisines are like cultures: moving targets. And the fact of the matter is, people immigrate to different countries all the time and they adapt recipes from the homeland to new ingredients and kitchens. They don't starve while waxing nostalgic about authenticity. My parents left Algeria in the 1960's for Lyon, France where I was born. A few years later they moved to Montmerle-sur-Saône and my Kabyle mother continued to prepare simple, rustic Berber dishes. Lamb mechoui is roasted or bbq lamb. For the First Annual Couscous Festival, Ronnie Gilman (my former student and friend) drove all the way to Texas to buy a custom smoker for our whole lamb mechoui. Ronnie is a cowboy. I am Berber. Neither of us doing anything small. After smoking overnight, the lamb was falling off the bone tender. We served pulled lamb tacos, our version of Tacos Arabes. We sold out of four whole lambs in no time. A few people asked if they could take the roasted heads home for stock. One of my general assistants hails from Sinaloa, Mexico. He made chicken tagine tamales for his family last Christmas. He reported back that they just loved it. That's how North African cuisine will enter American kitchens, it will be by adapting North African dishes, ingredients, and techniques to existing kitchen grammar. 2) Make a paste with the butter, garlic, herbs and spices. 3) Place the lamb in a large roasting pan. Make a dozen or so deep incisions into the leg, Season the lamb with salt and pepper. Stuff some of the seasoned butter into the incisions and pat onto the skin. Add 1 cup of water to the pan. ﻿Serve with bread, salad, and harissa. First of all I'd prefer a larger and deeper base. The shallow, small base limits the kind of tagines that can be prepared in it. It performs best for braised tagines with very little liquid added, but is simply not large enough for layered tagines or tagines that call for lots of sauce. This is another intermediate clay tagine recipe. I used my terracotta tagine purchase from Sur La Table for this tagine. If anyone in the States, France or the U.K. knows of a tagine distributor of Algerian made cooking vessels please let me know. This is a piquant, peppery tagine with a touch of smokiness from the ancho pepper and sweetness from the carrots and tomato paste. In Algeria we use a smoked paprika similar to pimentón, smoked paprika this a a great dish to add a little pinch of it too. I would say that broadly speaking this tagine is Oranaise. First photo- ingredients for my dersa spice paste and aromatics. Half a medium onion grated, 3 small carrots finely chopped, two bay leaves, half an ancho pepper, 1/2 teaspoon of sumac, 1 teaspoon Aleppo pepper, 1 teaspon merguez spice blend, and 2 cloves of finely minced garlic. Lahm is Arabic for meat which almost always means lamb, but doesn't exclude beef either. I'm used beef short rib for this tagine because I like the cut for slow cooking. I chopped the carrots into small dice because I want them to cook down into the sauce as a thickener and to add a little sweetness. Second photo- Aromatics, spices and 3 tablespoons of olive oil after they've cooked over low heat in the tagine for 10 minutes. Third photo- 3 ounces of tomato paste fried with the aromatics and spices for 3 minutes. Cooking tomato paste this way is a North African cooking technique. It heightens the sweetness of tomato paste and intensifies it's flavor. Add 2 pounds of beef short rib (bone in) to the tagine and thoroughly coat with the blend of tomato paste, spices and aromatics and add 2 cups of water as shown in the fourth photo simmer for 1 hour and then add the beans. This is an intermediate level recipe. I don't recommend it as the first tagine recipe to try. I used a clay tagine I bought at Sur La Table for $20-$25, it's made in Portugal and must be soaked in water before initial use. It can be used on the stove top and the oven. This is an earthy, spicy lamb tagine recipe which I would describe as more Annaba in (eastern Algeria, near Tunisia) in flavor profile. Quite a contrast from the milder, sweet lamb tagine I gave to the LA Times for the "Tagine Dreams" article about me. That recipe is more in the style of Tlemcen (western Algeria, near Morocco). Those of you who've cooked my other tagine recipes will immediately notice that this one has a stronger aroma of spices than most of my dishes. The flavor and aroma will mellow considerably with long slow cooking. Use lamb shanks for a more "glamorous" presentation. Beef short ribs also work well with this recipe. The first photo is of the spices I used before I ground them in my spice grinder. The spices are nutmeg, cinnamon, turmeric (this has to be grated on a rasp), allspice, peppercorns, fennel, cumin, coriander, saffron, caraway, zaatar (wild thyme) and nigella seeds. You can use other versions of my ras el hanout if you have that in your pantry. The third photo is of the dersa ingredients combined. Spread the dersa paste so that it evenly coats the bottom of the tagine. Lay 8 pieces of lamb neck on top of the dersa, place tagine on stove and turn heat onto low. Slowly raise the heat to medium low. Turn the lamb pieces after 5-7 minutes, the color will be yellow from the turmeric and saffron as shown in the photo. I'm sure the scholars are cringing when it comes to my "sloppy" transliterations. I promise it will be more consistent in my book. But for this blog I am using more common transliterations for Algerians so that key word searches point here. This is definitely a dish for lovers of fatty cuts of meat and briny olives. If you are hesitant about trying this dish because of the amount of olives, you can cut back the amount to your liking. Algerian cooks might not boil or soak the olives before adding them to the dish, but you can if you think adding the olives straight would be too salty for your palate. You can use meat from the shoulder or leg. For me the fattiness of the ribs contrasts deliciously with the briny olives. Also the dish is cooked very slowly and the bones add a depth of flavor to the sauce that cubes of boneless meat cannot. Algerian Mechoui made in Sonoma, California. Terrific photos worth a look. Traditionally a mechoui is a roasted whole lamb. Mechoui means roast over a natural fire, not baked in an oven. Not surprisingly a whole lamb does not fit into my home oven. And I do not have the space to build a pit or an oven outside. Eventually I will post photos of a whole lamb being roasted outdoors with different types of heat sources. Algerian roast lamb is cooked very slowly while basting with butter or olive oil or both. The seasoning can be as simple as just salt or can include a range of spices. The meat should be extremely tender with a crispy skin. Personally I do not like "duplicating" the crispy skin that results from cooking over a natural fire in an oven by turning up the heat during the last 15-20 minutes of cooking. Something about the texture bothers me. Sweet meat dishes are another Ramadan specialty. This version is unctuous and sweetened in layers with caramelized vegetables, dried fruits and honey. But it is not cloying when eaten in the proper quantities with other dishes to refresh the palate. I have been omitting serving sizes intentionally. If an Algerian family of twelve has three lamb shanks, well then that's feeding twelve mouths. If an Algerian family of four has three lamb shanks, well then that's feeding four mouths. The Algerian way of eating is always communal. A sense of sharing and consideration is inherently built into this concept. I am aware that I have been presenting alot of meat dishes. I mentioned early on that the Zadi family ate much more meat than is typical. The Algerian diet for the most part is composed of whole grains, legumes and vegetables much more so than meat. To the ill-informed it might seem like a meat ragu with pasta is a dish introduced into Algeria by the Italian pied noirs. I'll keep making this point until it's permeated thicker heads. I'm a bit frustrated with the assumptions made about European influences in North Africa. Durum wheat pasta is a North African invention introduced into Sicily by the Saracens. Of course the Italians took it to their own level of culinary artistry. I've been to Italy and I still remember the pasta dishes with a big smile. Long before the European colonials crashed into North Africa, Algerians were eating pasta with a range of sauces. Traditional Algerian pastas take the form of pasta balls or berkukis, hand rolled short noodles, hand rolled long noodles, strips of pasta cut into various widths or little squares the size of postage stamps. The same sauces used for pasta dishes are also often used for torn crepes or rougag. Some of you may be wondering why I present such small portions, when North African cooking is known for huge platters of food. Most of us Maghrebis have been to feasts or even "regular" meals where platter after platter of food was served. It's not an exaggeration to say that some couscous platters need several people to carry. I work teaching double shifts at the school, so most of my meals during the week day are taken there. My wife is petite and my two children are still very young. So our home cooking these days is reduced in portion size. I promise to present all the variations of our wonderful dishes and photographs of how we eat. This will take along time considering how old our culture and cuisine are. The traditional amount of sugar for this dish might be unacceptable to those not accustomed to sweet dishes of meat. I have tried it without any sugar and it is still delicious. But the dish has to be seasoned with salt then.